An easy way to make jewellery cheaper, use only 1/3rd of the gold. Bigger profits &/or more discounting room for the factories or the shops or both. Despite our strict laws it still happens as the vast majority of jewellery is now made in Asia. 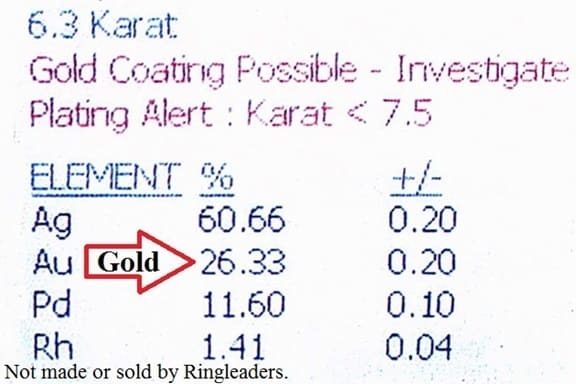 This has been such a big problem in Australia, a few short years ago several refiners after noticing a shortfall in the return of gold from scrap jewellery, approached a leading jewellery industry body and asked that a policy of testing be implemented in Australia. This has never come to fruition. But this is a problem in almost every country around the world to more or less of an extent, depending on the laws and nature of business in the country. 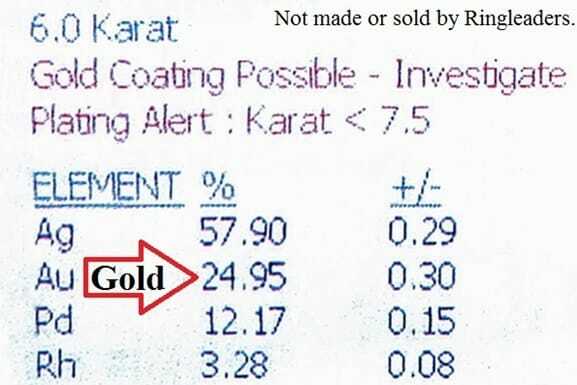 Not all under carat gold is picked up by jewellery valuers, some don’t have the expensive equipment to test thoroughly, and sometimes they don’t test the gold correctly or just don’t test. Here are two examples of rings made in overseas factories that was picked up by an excellent valuer. Pic 1. A wedding ring Stamped 18K tested as 6.24ct (26.33% gold) about 1/3rd the 18ct gold it is hallmarked stamped. The 2nd ring with a 9.00ct Aquamarine with Diamond halo, also stamped 18K had different carat gold in the setting 5.988ct (24.95% gold) Band 6.211ct (25.88% gold) only 1/3rd of the gold the 18ct gold hallmark stamped implies. 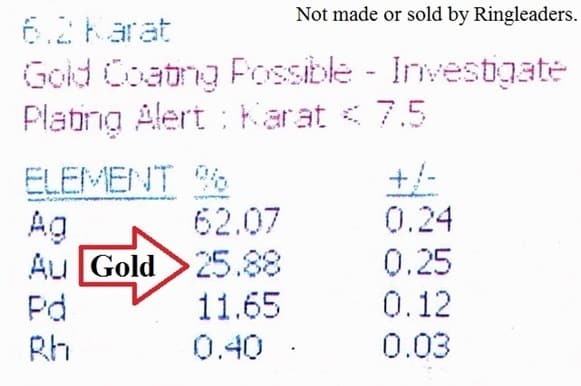 18ct gold is 75% gold, 9ct gold is 37.5% gold. Pic 2. Setting test results. Pic 3. Band test results. Yes, this practice is illegal but still happens, especially since the Gold price stopped being artificially deflated, (after decades of countries selling off their gold reserves. That’s why the gold price went up years ago to the price it should have been). Au is the element symbol for Gold, short for the latin Aurum.